I consider North Africa one of the most interesting theaters of War in WWII. It is unique due to the nature of the environment, which provided backdrop to some of the most interesting camouflage schemes of the war. Since the North African battles were one of the (relatively) early ones, both Allies and Axis were going through the first phase of the learning process that occurred during the war. 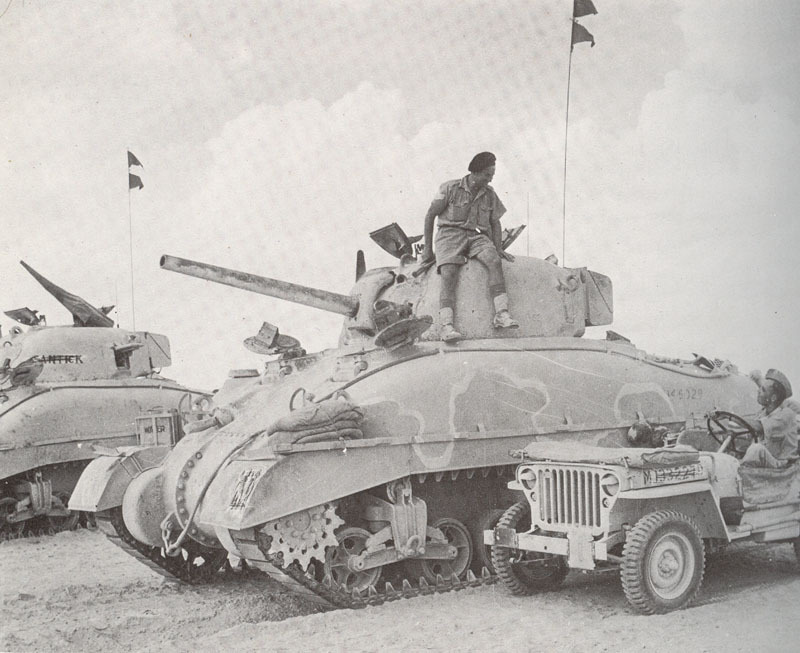 As a result, battles in North Africa involved many unique and experimental vehicles, which mostly acted as an expedient solutions to an immediate tactical problems. From the Allied perspective, North Africa saw perhaps the largest variety of combat vehicles compared to other theaters of WWII, especially on the British side: obsolete WWI vintage armored cars, one of the last cruiser tanks, Vickers, Valentines, Crusaders, Matildas, Churchills and of course, the first of Shermans. 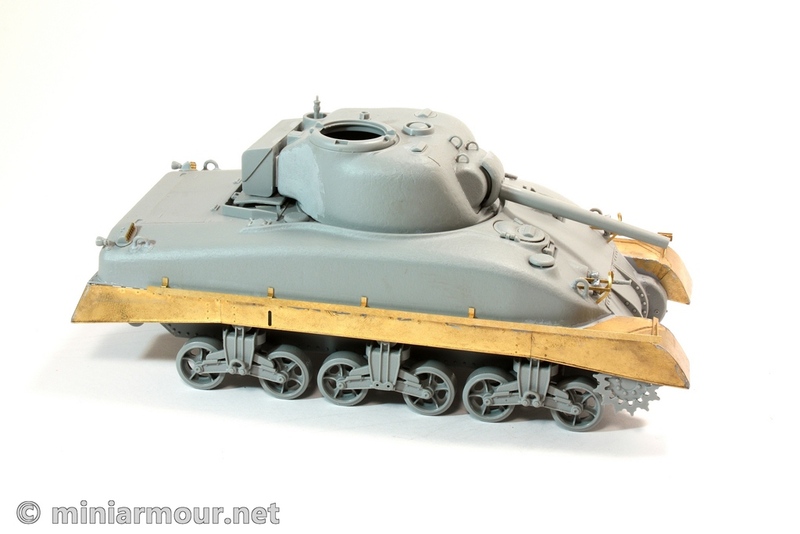 I have been planning to build this particular version of the Sherman for quite a long time. 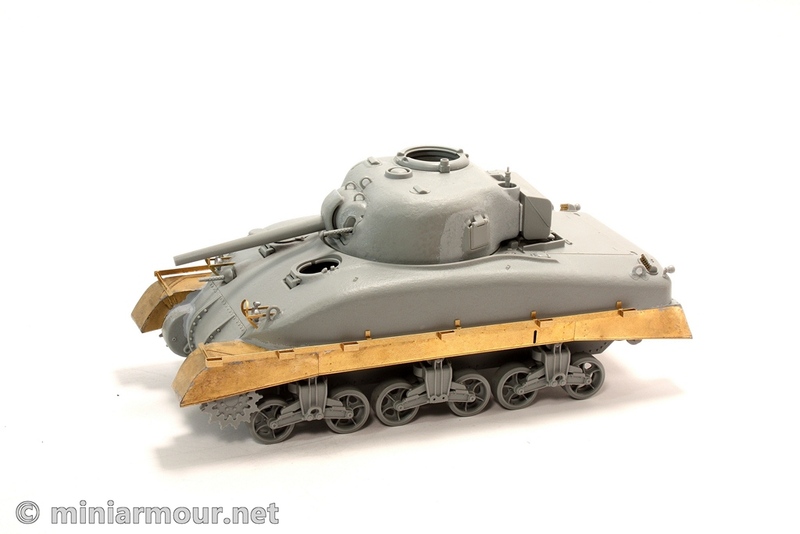 Long enough to source the old (and inaccurate) Dragon’s early Sherman kit and Formations conversion kit. 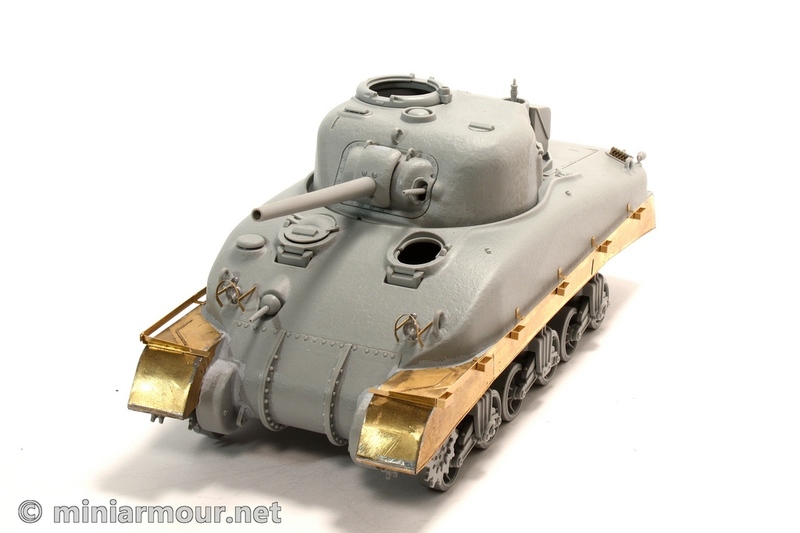 As is often the case, by the time I got to build this tank, that specific Sherman version was released by both Dragon and Tasca. Having the choice of these two producers, I have decided to go with Dragon. The main reason was that Dragon’s kit provided markings for the exact version of the vehicle I wanted to build. The markings I want to use are the ones of the Headquarters of the 2nd Armoured Brigade. The camouflage option is based on a rather famous photograph (see below) of a peculiar camouflage scheme, which is not seen on any other photograph and which has caused many discussion about its origin and purpose. Retrospectively, this decision to use Dragon’s kit did not prove to be the smartest one. Echelon is to release (or already released) the exact markings which I needed and there might be few reasons, why I would advise using Tasca kit, having had the experience of building the Dragon’s one. As can be seen from the pictures, I am currently at the stage where I have built the hull and the turret of the vehicle. I am almost at the end of the process of adding the photoetch parts, after which I will add the tools and stowage. The kit only provides for photoetch sand skirts. They are fine when you put them together, but their construction is definitely not for novice modeller. Soldiering skills are a must as I can’t see these skirts being built using glue. (Compared to this, Tasca kit provides plastic sandskirts, which I believe should be much more easier to build.) During the cleaning of the soldier joints with a file, I have lost some details of the bold head (or screw heads) on the outer side of the skirts, will have to replace these with a styrene pieces created with a punch-and-die set. Each skirt is built from three parts. In order to strengthen the joints between them, I glued Evergreen styrene strips to the back of these three parts, so that these line up correctly. When you attach these skirts to the hull, you can’t see them unless you are looking directly from the bottom of the model. I glued these strips through the middle of the skirts (vertically), so that there is a gap between the upper edge of the skirt and this strip. This is because there is no practical solution provided in the kit on how to join the skirts to the main hull of the tank. In order to provide some attachment points, I glued 5 L-profile pieces of styrene strips at the bottom of the sponsons spaced at the regular interval, so that the skirts can be glued to them and flush with the sides of the hull (but in order to glue the skirts to them, the strengthening styrene strips had to allow for space at the top of them). In a similar way, I added short styrene strip to the bottom of the front of the sponson, so that it protrudes to the front and can be used to support the front (horizontal) section of the skirt. Before gluing the strips, I had to sand off bit of the bottom of sponson to have the skirt sit right. I think these changes made the attachment of the skirts to the hull much stronger, without it they would be too flimsy to survive subsequent construction steps and painting. The front curved section of the skirts is quite well shaped, but you could still end with a gap between the skirt and hull, I filled this with Mr. Surfacer. Dragon’s DS tracks are rather nice and save a lot of work, but when I mounted them on the kit, I found they are too long. Archive pictures clearly show that the real tracks were not as loose. At this time I hope that I can deal with this issue by cutting of one of the two track sections, that are to be used for joining ends of the tracks and that one such section will suffice for having strong enough join. 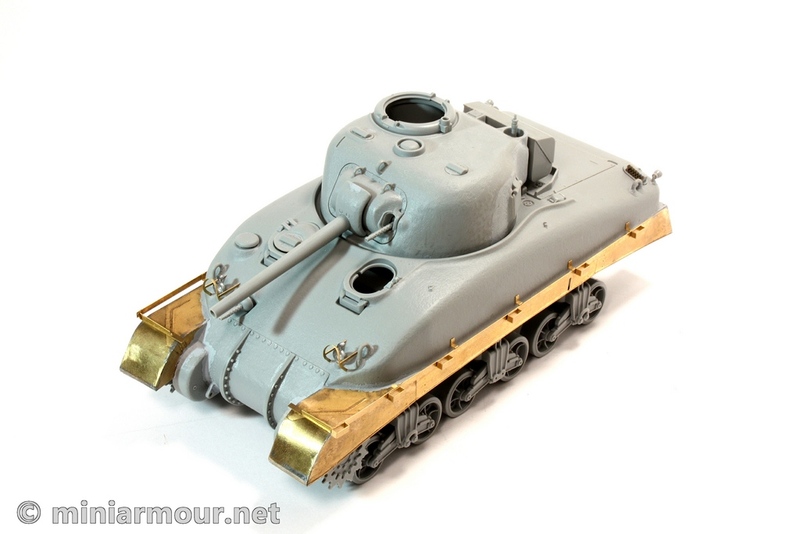 Side stowage brackets – these can be bit difficult to build and add to the tank. 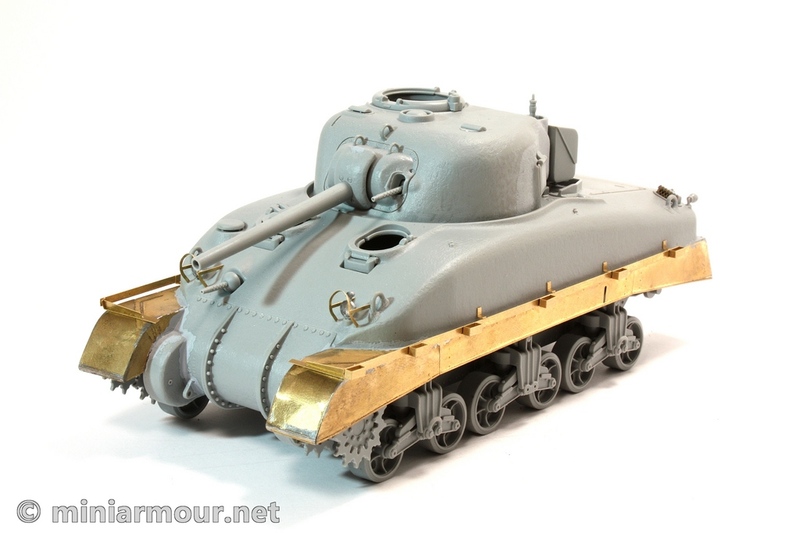 Having already built Italian Sherman III, I had benefit of the experience of having them built before. They are difficult to work with as they are rather long and have number of attachment points to the hull. It might take some planning on how to get them aligned properly, but I luckily got them right the first time. I have added the 6 small square brackets to them, only after the main bracket was already attached to the hull (I only finished them on the left side so far). Front lights are provided in clear plastic and I had airbrushed their rear side with Tamiya chrome silver (any other similar metallic paint should work fine too) before attaching them to hull. This is to avoid the primer being visible through their front section, once the rest of the tank is painted in my “regular” way. I will of course use artist masking solution (friskit) to mask the front lenses before painting the tank. Front light protection frames – you have the choice of plastic or photoetch ones, the latter ones of course look much better. There is a plastic part provided, that can be used to shape them. This comes handy, though you might still need to tweak them a bit to get all 4 attachment points sitting square. Stowage box on the turret rear – looking at the pictures of the actual vehicle, it seems to me that the box is not attached directly to the turret, but there are some spacers provided. I used two styrene strips again to replicate this. Barrel holder on the commander’s hatch ring – (btw – I was wondering for long time what this part was actually for on a real vehicle). Given that Dragon provides quite a bit of PE parts in this kit, it is surprising that this part is only provided in plastic (part B22). I guess it’s because Dragon believes this part might be difficult to assemble in photoetch. However this part is highly visible on the top of the vehicle and it would be nice to give modeller an option to have it look better. Front ribs on the transmission cover – these have moulding line running right through the middle of them. I was thinking about cleaning it first, but… these ribs are actually made of two parts on the real vehicle, which are attached with all the screws. There is a groove running along the length of these ribs, where these two parts meet, right where the moulding line is. So I am thinking of leaving the line on, or maybe modifying it a bit, or using it to engrave the recessed line and only then sanding it off. At this time I plan to finish off the construction with just a few modifications. I plan to replace the hatch handles with the ones made from wire. I am also thinking about using Formations resin tool set. Kit offers photoetch mounting brackets for the tools, which would look good too, I just wanted to try the Formation ones.